We’d love your help. 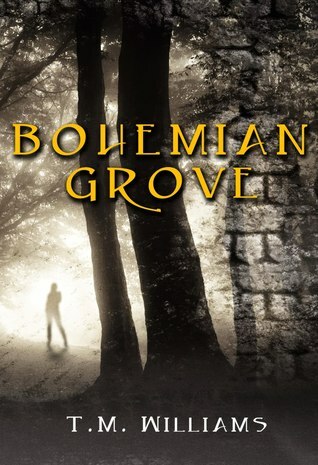 Let us know what’s wrong with this preview of Bohemian Grove by T.M. Williams. As Carter finds that she holds the key to connect with her ancestors from the planet Nibiru, the Vaticates What if alien life did not contact us? What if we are alien life? Jack is in the wrong place at the wrong time and ends up tangled up in the chaos and dangers of Carter's life. As they become drawn to each other Carter meets another who calls to her in ways she can not control. The only question is, is it because of their celestial link? Or because of something more? To ask other readers questions about Bohemian Grove, please sign up. The story follows a woman named Carter as she finds out she is part of an alien race, and there are factions that would have her race destroyed. I hate giving bad reviews. I know it can't be an easy thing to write a book, and I appreciate the work authors put into their writing. However, I'm completely baffled by all the 4- and 5-star reviews this books has received, as it is probably one of the worst books I've read, both in ed I won this book in a Goodreads First Reads giveaway. I hate giving bad reviews. I know it can't be an easy thing to write a book, and I appreciate the work authors put into their writing. However, I'm completely baffled by all the 4- and 5-star reviews this books has received, as it is probably one of the worst books I've read, both in editing and plot execution. I can easily overlook a typo or two - nobody's perfect. However, when the third word of a book is misspelled, then misspelled again in the next sentence, or when the protagonist is described as having "griped" a sink in the second paragraph, I just, ugh... I almost put it down after that first page, but I soldiered on, figuring it had to get better. Nope. Sentences are missing words, incorrect tenses are used, commas are placed willy-nilly or not at all, random apostrophes are just hanging around, and capitalization is missing from proper nouns. Words are repeated ad nauseum in single paragraphs; there is no reason to use the word "tea" four times in four lines. The same words are used over and over to describe things. Jack smells musky, William smells musky, William's breath smells musky, the forest smells musky. Are there no other smells in Bohemian Grove?! We get lines like, "She kicking herself internally for being so dense," "They rode the entire way in silence and he guessed it was partly due to his lack of keeping up with the conversation," and "The air became ambiguous." Continuity is also a problem. On one page, Jack's nose is broken rather violently (his face "explodes") by one of the "kidnappers" to stop him from following after Carter and the other "kidnapper," while on the very next page, Carter wakes up (after being chloroformed), and everyone is in the same room. Why the nose-breaking, then?! This felt like a first draft that neither the author nor anyone else proofread before publishing. As for the plot: it had potential. An alien race that helped shape the course of humanity? Good. A religious faction that wants to keep the public from finding out about the aliens in order to preserve religious institutions? Super. Unfortunately, the book spent far too much time focusing on an insipid love triangle than it did fleshing out the alien/religion idea. Carter gets all tingly around Jack. Carter gets all tingly around William. Carter realizes she's falling in love with Jack. Carter's making out with William. Maybe she just got confused as to who she was with because they smelled the same. Musky. As I was reading Bohemian Grove, I felt the more I read the less I knew what was going on with the characters. Thus, I believe there could have been more time devoted to character development. The lack of this has resulted in two dimensional unlikable characters. I realize this is the first book in a trilogy and hopefully the characters will get more developed and able to deal with whatever is thrown at them. But for now, they are presented as weak I received this book from Goodreads first reads. 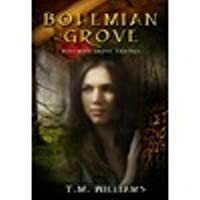 OK, so I was lucky enough to get my hands on an advanced copy of Bohemian Grove, which is why I'm writing an early review. First, a quick synopsis. Carter's living a pretty normal existence when suddenly everything starts going screwy. She finds herself facing the possibility that everything she knows about her life has been a lie, (view spoiler)[including her humanity. (hide spoiler)] Add to that, becoming a target for a group of baddies, being taken away from everything she knows and loves, and, oh yeah, the likelihood that the fate of an entire race of beings probably rests on her shoulders, and you can understand why she might not be having a good day. With the help of Jack, a casual friend who could be more, she faces her new reality, trying to figure out what and who she should believe in. It's an exciting book! I was instantly wrapped up in Carter's story, and found it hard to put the book down. I love the mixture of fact, fiction, and theories found throughout the story. On more than one occasion I found myself looking something up mentioned in the book, needing to know if it was (or could be) true. I was surprised that, on almost every occasion, there was more than a little truth mixed into the story. It's a perfect balance, just true and creative enough to have you wondering if you need to rethink everything you know about humanity and our earliest history. There's also a cast of supporting characters that will make you laugh, fall in love with, grind your teeth over, and occasionally even cry for. Not to mention, a baddie you will love to hate, and hate to love. This is the first in a planned trilogy, and I definitely think it shows a lot of potential. Bohemian Grove wraps up in a way that will leave you satisfied, but definitely wanting more. I'm looking forward to getting my hands on the next book, to find out what happens to Carter and Crew! Thrilling, mysterious, action packed, suspenseful, and educational (yes, I said educational) are all adjectives that can be used to describe this very good work. The aura of suspense fell over me as soon as I was introduced to Carter and her immediate plight. Future readers, this will get you on the edge of your seat and ready to enjoy the ride on the Bohemian Grove roller coaster. Scholars of real ancient history (readers of Sitchin and the like) and belief systems will want to take notes so tha Thrilling, mysterious, action packed, suspenseful, and educational (yes, I said educational) are all adjectives that can be used to describe this very good work. Scholars of real ancient history (readers of Sitchin and the like) and belief systems will want to take notes so that they can research the material referenced. One of the beauties of this novel is that the scholarship references are perfectly woven into the thrilling story line. It is very difficult to pull that off, yet this writer did it. Of course; a great novel not only has twists and turns, but also a romantic element. The dynamics of the characters involved here plays out very well. Readers will be looking for the rest of the trilogy to come out yesterday just to see what happens with these relationships. I love the characters and the idea that there's something going on with ancient aliens. I'm a huge fan of the history channel and was happy to see a fun story based on this theory. I also love the connection the author brings between the ancient alien theory and religion (Vaticates). *spoiler alert* I can't wait to read the next book and see who Carter, the main character, ends up with from her love triangle. There's a lot of deep meanings in the book that are hidden that I really enjoyed and ca I love the characters and the idea that there's something going on with ancient aliens. I'm a huge fan of the history channel and was happy to see a fun story based on this theory. I also love the connection the author brings between the ancient alien theory and religion (Vaticates). Won this through a Goodreads Giveaway. I really enjoyed this novel. The characters were well rounded and the story well planned. I couldn't put it down. I found my heart in my throat several times. I'm looking forward to the next installment! BOHEMIAN GROVE is a book whose story really grew on me. I was initially expecting a solid read with rather clearly defined good and evil elements. I must say I was delighted to find a story with real depth and outstanding plot lines. Good and evil are not so clear cut here. Carter, the lead character, discovers she is an alien, an Anunnaki, a race that has been shepherding along human development, even human evolution. On the other side are the Vaticates, who are the defenders of faith and religi BOHEMIAN GROVE is a book whose story really grew on me. I was initially expecting a solid read with rather clearly defined good and evil elements. I must say I was delighted to find a story with real depth and outstanding plot lines. Good and evil are not so clear cut here. Carter, the lead character, discovers she is an alien, an Anunnaki, a race that has been shepherding along human development, even human evolution. On the other side are the Vaticates, who are the defenders of faith and religion, bent on destroying the Anunnaki. Essentially Carter and her friend Jack are kidnapped by the Anunnaki and taken to Bohemian Grove. There Carter learns more about her heritage and how very special she is, to both sides of this argument. Carter becomes entangled in a love triangle with Jack and William. William is an Anunnaki, to whom she is very much drawn. Jibril, leader of the Vaticates, tells Jack that Carter should beware of William, because he claims William can extract the information the Anunnaki from Carter even if she ends up dead. There are many altercations in the book. It is very fast paced and it really makes the reader pay attention. Is either side in this really in the right? Would the new knowledge put an end to faith and religion? Even if so, does this justify the genocide the Vaticate is apparently perpetrating? It becomes crystal clear that Carter isn't being told everything. No doubt some of that which is being held back is actually vital - to her survival and to the survival of humanity. Wow. Another hit for TM Williams. This book has it all, romance, mystery, and conspiracy too!! From the beginning of this book, it’s full throttle! Who really built the Egyptian pyramids? What about Atlantis? Sure man had a hand in all that, but was it solely man who created them? Now what if alien beings came here to Earth and helped, they gave us technology to advance and some stayed with us. Passing their traits down, generation after generation after generation. Enter Carter your average woman, with a full life of friends and her dad. She lost her mom at an early age. Then she learns that maybe, there is more to life. Especially her life. That’s she not truly all human. That she is the key to bring another humanoid species here, again. But there is another group that do NOT want her to succeed and they will do anything and everything to stop Carter and her fellow beings. She is spoon fed the truth, little by little they give her information. They train her, they are all around her at all times. She even fines love; in an unlikely place. It's about time someone wrote an ancient astronaut fiction story. Everyone is into vampires and warewolves but there is something new and interesting with the ancient astronaut theory. The only thing I wished was that somehow it indicated that this was a trilogy when I bought it. The good thing the author did not leave it with too big of a cliffhanger. I definately am anxious to read the next book. I read this book in one sitting. The beginning starts off pulling you in and there is a little bit It's about time someone wrote an ancient astronaut fiction story. Everyone is into vampires and warewolves but there is something new and interesting with the ancient astronaut theory. I read this book in one sitting. The beginning starts off pulling you in and there is a little bit of slowness in the first half of the book but the it quckly builds up and is a page turner. I could not put it down. I like that the author was able to give each character their own "voice". I am a huge Jibril fan and his character is so fun that I would not mind reading a book on just him. I hope we see more of him in the second and third book. Johns character was a fun surprise and am looking forward to learning more about William, because we don't learn enough about him in book 1. I am happy the author put in a love triangle because it opens up the demographic and adds an element to sci-fi that isn't normally there. It's not your typical love triangle either because there's a sci-fi mystic ther as well. The characters in this book are fantastic. I was a huge fan of John. The author does a great job of distinguishing the characters 'voices' and giving them their own personalities without making them typical or cliche. I ended up looking up a lot of the stuff on google and was really excited ot hear that they were real theories and events that the author mixed in with her story. I can't wait for the next book in the trilogy! What did I think? It's really simple actually. I thought that it was AMAZING! This has everything you look for in a story!! I cannot wait to read Sun Gate. Once again, not a genre I would normally have gone for. What can I say? Ms. Williams has gotten me hooked. I couldn't put this one down and actually found myself yelling at the characters in the book to give them advice. I don't think I've done that since my Nancy Drew days. The settings were vividly described to the point that I felt I was actually there. Looking forward to the next installment. five stars. Look forward to reading more from this author. I won this through the goodreads giveaways . Really good book , the story is quite captivating and you can't help but wonder what will happen in the next book ! The characters are really well defined and you can very well feel their emotions (I found myself even tearing up a little at some point).